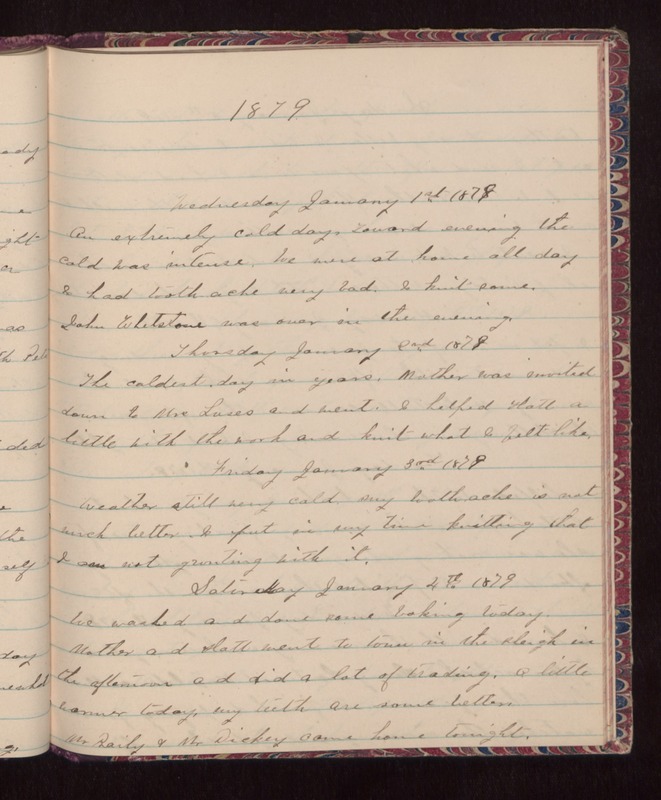 1879 Wednesday January 1st 1879 An extremely cold day. Toward evening the cold was intense. We were at home all day I had tooth ache very bad. I knit some. John Whetstone was over in the evening. Thursday January 2nd 1879 The coldest day in years. Mother was invited down to Mrs Luses and went. I helped Hatt a little with the work and knit what I felt like. Friday January 3rd 1879 Weather still very cold. My tooth ache is not much better. I put in my time knitting that I am not growling with it. Saturday January 4th 1879 We washed and done some baking today. Mother and Hatt went to town in the sleigh in the afternoon and did a lot of trading. A little warmer today, my teeth are some better. Mr Baily & Mr Dickey came home tonight.